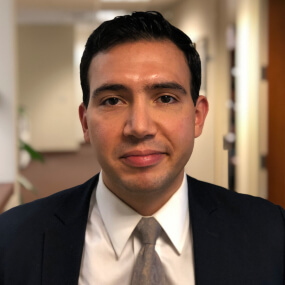 Danny Essadiq is a civil litigator at the New York office of Nicoletti Gonson Spinner. His practice focuses primarily on the defense of complex tort litigation. Mr. Essadiq has experience handling cases relating to General Liability, labor law, property damage, and motor-vehicle accidents. Mr. Essadiq earned his Bachelor of Arts degree from Syracuse University. He earned his Juris Doctorate from Syracuse University College of Law (2013) where he was a member of the Elder Law, Children’s Rights, and Family Law Clinics.